Did Jesus really imply that helping this woman was like throwing food to dogs? Most of us would have taken great offense at what Jesus said as a result of our pride. But what He said was true and was not rude in any way. Jesus obviously cannot be rude. Nonetheless, His statement has the superficial appearance of being rude. First, let’s look at how His statement is true. Jesus was being asked by this woman to come heal her daughter. Basically, Jesus tells her she is not deserving of this grace in anyway. And that’s true. No more than a dog deserves to be fed from the table do we deserve the grace of God. Though this is a shocking way to say it, Jesus says it this way so as to first illustrate the truth of our sinful condition and unworthiness. And this woman takes it. Second, Jesus’ statement allows this woman to react with the utmost humility and faith. Her humility is seen in the fact that she does not deny the parallel to a dog eating from the table. Rather, she humbly points out that even dogs eat the scraps. Wow, this is humility! 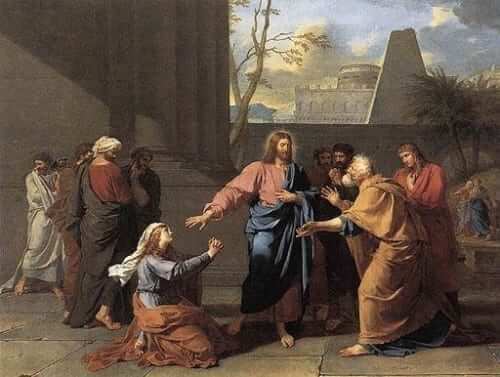 In fact, we can be certain that Jesus spoke to her in this somewhat humiliating way because He knew how humble she was and He knew that she would react by letting her humility shine forth so as to manifest her faith. She was not offended by the humble truth of her unworthiness; rather, she embraced it and also sought out the abundant mercy of God despite her unworthiness. Humility has the potential to unleash faith, and faith unleashes the mercy and power of God. In the end, Jesus speaks for all to hear, “Oh woman, great is your faith!” Her faith was made manifest and Jesus seized the opportunity to honor her for that humble faith. Reflect, today, upon your own humility before God. How would you have reacted if Jesus spoke this way to you? Would you have been humble enough to acknowledge your unworthiness? If so, would you also have enough faith to cry out for God’s mercy despite your unworthiness? These wonderful qualities go hand in hand (humility and faith) and unleash the mercy of God! Lord, I am unworthy. Help me to see that. Help me to see that I do not deserve Your grace in my life. But in that humble truth, may I also recognize Your abundance of mercy and never fear to call upon You for mercy. Jesus, I trust in You.